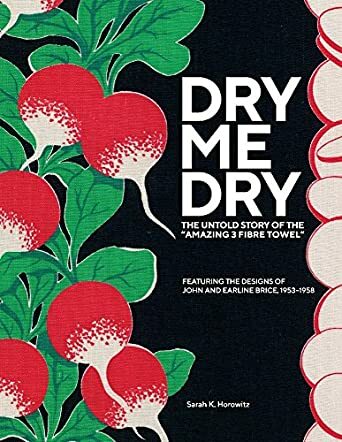 Dry-Me-Dry: The Untold Story of the "Amazing 3 Fibre Towel" by Sarah Horowitz started as an internet search for kitchen towels by the author, then turned into a passion project as she began researching the antique dish towels she couldn't seem to get enough of. The evolution of the patented Martex design delves back hand in hand with the family of Lanny Bledsoe, who was one in a line of five generations to work at the Riverdale Mill, starting with his great-grandfather in 1888. Horowitz takes us through the stages of how Martex came to be, with its apex of unique designs dating back to the 1930s and culminating into national fervor with the introduction of bold patterns in the 50's. Through a collection of stories, photographs, articles and ad clippings, and the articulate piecing of all these together by Horowitz, the book brings to life the Amazing 3 Fibre Towel once more. Dry-Me-Dry is a wonderful compilation that I was immediately taken with, helping me to understand the painstaking lengths Sarah Horowitz was willing to go over two years to present this book to the world. I fell in love with the designs and have since begun my own quest to acquire a dish towel here and there. The photographs are fantastic and Horowitz writes with comfortable authority. Most amusing are certainly the old advertisements claiming they are so good that even a man can do the dishes properly. But this isn't just a book about towels. There are a whole host of employees, designers, and laborers who contributed to building a brand; a human element that Horowitz revives alongside the mechanisms of industry and art. It is here that this book shines. I'd recommend Dry-Me-Dry to lovers of art and history, fashion and design, and everyone else who enjoys a fascinating read that just so happens to be about a perfect little textile.